It is a shame that Crossrail did not make its deadline of December 9th, but quite frankly, it was never going to. I have spent the last nine months writing a book about the new Elizabeth Line, the rather misleading operational name, and I realised quite some time ago that the deadline was never going to be met. There was simply too much to do, too much complexity and too many unknown unknowns. Nor was it a surprise that the budget limit of £14.8bn was broken and the eventual cost will be £15.4bn. The eventual announcement of the delay did, however, take me aback in two respects – the fact that the announcement of the opening day was in vague terms rather than a specific date – ’Autumn 2019’ – and that it was set so far ahead. I had expected May but I reckon that Crossrail’s managers wanted to make sure that this is the last bit of bad news they will have to communicate. There is even the change that possibly they may be able to squeeze in some kind of public service, perhaps not serving all the stations, a month or two early – which will give them a great news story – though don’t hold your breath. However, all this delay and cost will be forgotten once the line opens. There is no doubt that Crossrail will be instantly recognised as London’s most impressive piece of transport infrastructure. The money has been well spent. Of course it inevitably some will have been wasted but the important point is that there has not been any skimping on the details. This is a railway that my grandchildren’s grandchildren will be travelling on well into the 22nd century and that was always recognised by the scheme’s managers, if not their paymasters. The stations, therefore, are simply magnificent and on a scale far beyond anything London has seen underground before. That is why it was a bad idea to call it the Elizabeth Line – Crossrail is not a new tube line for London but a large mainline railway which happens to go beneath the capital. There are platform edge doors at all the below the surface stations, air conditioning on the which are through carriages which means passengers will naturally go to less crowded areas, and a very high design standard with lots of soft contours thanks to widespread use of sprayed concrete lining which gives a relaxed feel to the architecture. But above all, the sheer size of the stations will impress. 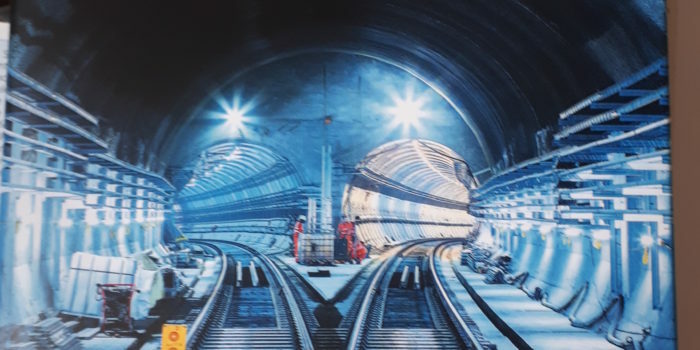 They are bigger than any existing Underground stations, apart from those like Kings Cross St Pancras that have recently been expanded and passengers will be amazed at the feeling of space compared with the Tube stations with which they connect. There is, though, one major flaw in the scheme, which is that half the 20 trains per hour (which can go up later to 24) will turn around at Paddington because no useful destination could be found for them. In a decision that will be seen as shortsighted, Alistair Darling scrapped the idea of running services through to Richmond and Kingston without creating another route for the trains arriving from the East at Paddington. Clearly, over time this will change and there are various possibilities, such as running services up the West Coast Main Line or running them south west through Heathrow, but all these will cost money and will take many years to realise. For now, though – or rather from next autumn – enjoy what is the most fantastic addition to the rail network in the capital – or indeed nationwide apart from the Channel Tunnel – since the early 20th century when three Tube lines were opened in 1906/7. Once it is open, there will be pressure to build Crossrail 2 – though at twice the cost, there is a rather big financial hurdle to overcome which will need some innovative forms of funding. And the opening of the line will increase be pressure from politicians in the North to get some rail investment on a similar scale outside London.